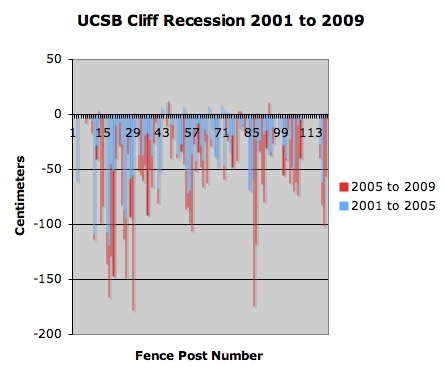 From 0 to 300 cm of the UCSB cliff edge eroded between July 2001 and October 2008, judging by comparison of measurements from the cliff edge to 121 fence posts between the Anacapa steps (south) and Bren Hall (north). Positive values indicate growth of ice plant and the concomitant difficulty of measuring the cliff edge where overgrown by ice plant. Uncertainty of measurements: to dirt cliff edge = ±5 cm; to ice plant cliff edge = ± 15 cm.